"The award is reflective upon the quality and high standards set by my USC Thornton faculty colleagues." 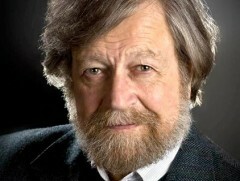 Morten Lauridsen, USC Distinguished Professor of Composition, has received the 2014 Outstanding Service Award from the University of Southern California Association of Trojan Leagues. As part of their mission foster and promote the interest of the university, the Association has honored one outstanding USC professor with the award each year since 1997. 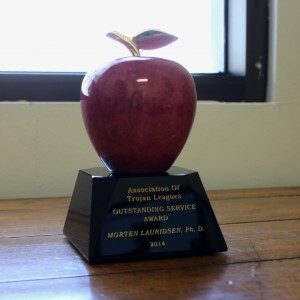 Each recipient receives the Leagues’ “Red Apple” statuette, along with a monetary gift. The Red Apple statuette has been presented to every winner of the Leagues’ award since 1997. Lauridsen, who first came to USC as a student in the 1960s, was the 18th recipient of the award, and the only one to be chosen unanimously. Professors are nominated by members of the Trojan Leagues and by past award recipients. Nominees must demonstrate significant academic contribution to their respective fields, possess a commitment to maintaining relationships with students and alumni, and foster the ideals of the Trojan Family. Past recepients include: President Emeritus Dr. Steven B. Sample, Provost Elizabeth Garrett, and Trojan Marching Band director Dr. Arthur C. Bartner. The Association of Trojan Leagues consists of seven Trojan alumni organizations across Southern California, with a combined membership of almost 1,000 alumnae.